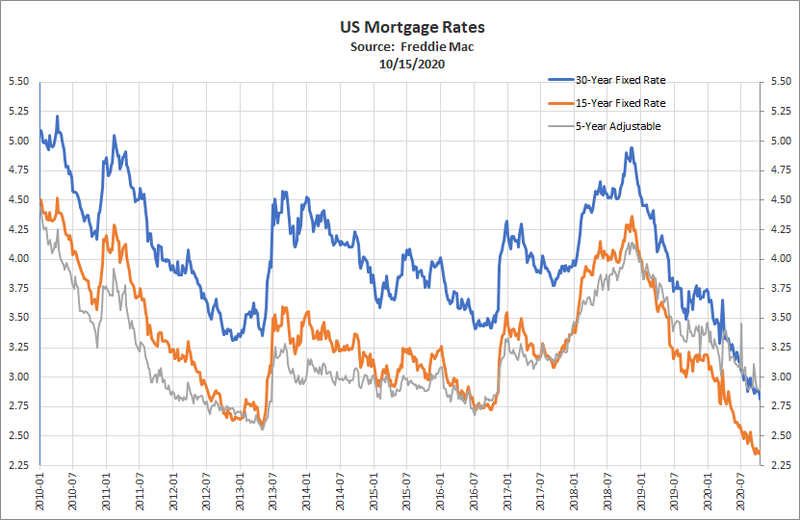 The 30-year fixed-rate mortgage (FRM) averaged 4.31% with an average 0.4 point for the week ending March 14, 2019, down from last week when it averaged 4.41%. A year ago at this time, the 30-year FRM averaged 4.44%. The 15-year FRM this week averaged 3.76% with an average 0.4 point, down from last week when it averaged 3.83%. A year ago at this time, the 15-year FRM averaged 3.90%. The 5-year Treasury-indexed hybrid adjustable-rate mortgage (ARM) averaged 3.84% with an average 0.3 point, down from last week when it averaged 3.87%. A year ago at this time, the 5-year ARM averaged 3.67%. Last week was an up week. The Down Jones Industrial Average ended up 1.57% to 25848.87. The S&P500 ended up 2.89% to 2822.48, and the Nasdaq Composite finished up 3.78% to 7688.53. The annual yield on the 30-year Treasury ended off 10 basis point to 3.02%. (+) The long-delayed retail sales report for January showed a rise of 0.2%, which slightly outperformed the expectations of no change. However, sales numbers for November and December were both revised in a downward direction by up to a half-percent. The headline figure was driven by declines in sales for both autos and gas stations by over -2%. Then, removing the most volatile components, more convincingly, core/control retail sales rose 1.1%, which beat expectations by a half-percent. Non-store/online retail grew by nearly 3%, along with strong months in health/personal care, grocery, general merchandise, and restaurants; on the other hand, furniture and clothing declined about a percent each. In addition to mixed winter weather, it appears that continued seasonal adjustment difficulties may have played a role in the sharp differences between January and the month prior, but the magnitude of this can be and has been difficult to tease out. (+) Durable goods orders for January rose 0.4%, surpassing estimates for a decline of -0.4%. The headline number was led by the usually-volatile category of aircraft/parts, which increased 13% for the month. Aside from that, core capital goods orders fared well also, rising 0.8%, surpassing expectations of 0.2%, in addition to a slight revision upward for the prior month. Core capital goods shipments also rose 0.8%, beating forecasts calling for a -0.2% decline. (-) The Empire State manufacturing index for March fell -5.1 points to 3.7, remaining in positive growth territory but far below the 10.0 level expected. New orders and shipments both fell in line by falling several points, but also remained positive, in keeping with the broader number, while the employment index improved into double-digit expansionary territory. The six-months-ahead business conditions component ticked down by a few points, but remained in a solidly-strong positive 30 reading. (0) The producer price index for February rose 0.1% on both a headline and core level, which was about half the increase expected for each. Under the hood, a rise in energy prices of 2% was outweighed by a drop in food prices. Year-over-year, PPI is up 1.9%, in keeping with other inflation measures, while core finished goods PPI accelerated a bit to 2.7%. (0) The consumer price index for February rose by 0.2% on a headline level, and 0.1% for core, sans food and energy—each just a touch below expectations. On the headline side, food prices rose 0.4%, while energy commodities jumped 1.5%. In other segments, shelter gained 0.3%, while several key areas fell in price, including new/used cars and medical care commodities. Including the most recent month, year-over-year headline CPI came in at a tempered 1.5%, while core rose 2.1%. The differential was largely due to the result of starting and ending points for energy prices (which were down -9% for the trailing 12 months). Outliers for the year included shelter, which gained 3.4% and reflects both higher actual rents paid as well as ‘implied’ rents calculated based on higher housing prices, and medical care services, up over 2%. Interestingly, a variety of other items were flat or even declined in price over the past year, such as consumer goods and prescription drugs (the latter no doubt feeling the heat from legislators). (0) Industrial production rose 0.1% in February, but lagged the 0.4% increase expected; unfortunately, December’s number was revised down significantly. In the most recent month, weather-driven utilities production led the way, as the manufacturing component fell nearly a half-percent, led by weakness in business equipment, while auto production also fell slightly to continue several consecutive months of declines. While the single-month data can be noisy, there does appear to be some deceleration in some of these production segments. Capacity utilization fell a tenth to 78.2%, despite estimates calling for several ticks higher. (-) New home sales fell in January by -6.9% to a seasonally-adjusted level of 607k units, which came in below estimates calling for a slight increase to 622k. Revisions for December, however, represented a positive 31k. While sales rose by 40k in the West, the other three regions saw declines, led by the South down -61k. (+) Construction spending rose in January by 1.3%, beating forecasts calling for a lesser 0.5% increase. While private residential construction declined slightly, non-residential gained upwards of a percent, while public construction of all types rose by over 4%, which potentially boosts prospects for state/local spending contributions to Q1 GDP (which needs a boost wherever it can get it). (-) Import prices rose 0.6% in February, which was twice the 0.3% forecasted increase. Petroleum prices were the primary culprit, up 5%, while prices without that factor only rose by 0.1%. Industrial supplies prices rose by 2%, followed by consumer goods up a few tenths and food prices down nearly a percent. While headline inflation is driven by oil price changes, the tempered change in core import prices (the ‘bad’ inflation) may serve to keep core inflation contained. (+) The preliminary Univ. of Michigan consumer sentiment index for March rose by 4 points to 97.8, surpassing estimates calling for a reading of 95.6. Consumer assessments of current conditions and expectations for the future both rose, with the latter outperforming the former. Inflation expectations for the coming year fell by -0.2% to 2.4%, while those for the next 5-10 years rose 0.2% to 2.5%, each in keeping with the range of recent results. (+) The January government JOLTs job openings report showed an increase to 7.581 mil., beating the median forecast calling for 7.225 mil. The rate of job openings rose by a tenth to 4.8%, as did the hires rate to 3.9%, while quits were flat at 2.3% and layoffs fell a tenth to 1.1%. The JOLTs number represented a new high for the cycle and serves as another data point of very strong labor market activity. (0) Initial jobless claims for the Mar. 9 ending week rose by 6k to 229k, slightly surpassing the 225k expected. Continuing claims for the Mar. 2 week rose by 18k to 1.776 mil., which came in above the 1.763 mil. level expected. No quirks were reported by the DOL, and levels remain at very strong/low levels, indicative of minimal layoff activity. Every sector was in the green last week, led by technology, energy and healthcare, with tech sentiment boosted by the announcement of a new Apple streaming service. Industrials brought up the rear with barely a gain—hurt by Boeing’s disastrous -10% week due to the global grounding of a version of the widely-used 737 following the second consecutive crash involving the model as investigations into the causes continued. Foreign stocks gained as strongly, or slightly better, than U.S. equities, with help from a weaker dollar as well as the seeming likelihood that a ‘hard Brexit’ would be avoided at the end of March. The most recent deal departure from PM Theresa May was again rejected, but parliament did agree to reject any ‘no-deal’ departure—which is a positive in a roundabout way. An extension seems the most likely outcome, although the idea of another public referendum is being discussed again at a possibility. Emerging markets were led by strength in a variety of regions, including support for additional Chinese stimulus to combat the recent slowdown as well as positive political news in India and Brazil. U.S. treasury bonds ended the week just slightly higher, with little change in interest rates. Interestingly, the partial yield curve inversion has persisted between the 3 month and 5 year parts of the market, which serves as the market’s lack of confidence in growth or inflation prospects over that near-term time frame. High yield debt earned far sharper gains, along the lines of equities and tightened spreads. Foreign bonds fared especially well, helped by the USD, which fell nearly a percent for the week. Emerging markets ended best, with both spread and currency effects working in its favor, and continuing a run of an approximate 5% return year-to-date. Commodity indexes gained a few percent on the week, with positive returns in all segments, led by energy and agriculture. The price of crude oil rebounded by over 4% to end the week at over $58/barrel, offsetting a -2% decline in natural gas, as winter’s effects are beginning to fade. Crude ticked higher due to ongoing production cuts by OPEC, in an effort to stabilize prices higher, in addition to a pickup in estimates for oil demand. Oil’s near-40% price rally from lows around Christmas have brought pricing levels back to where they were in mid-November. Although the magnitude has been far more dramatic for crude, the price chart shape looks nearly identical to that of the S&P 500—reinforcing that macro factors have dominated over the past several months.